Kyrgyzstan is the only country in Central Asia that surprises with its unpredictable elections. Fergana News Agency with the assistance of its sources drew a picture of the current situation. Social and Democratic Party of Kyrgyzstan nominated Prime Minister Sooronbay Jeenbekov for President clearing doubts about the successor. While President Atambayev, who led this ruling party before his election as the head of the state, made a remarkable note saying if his former party had not selected Jeenbekov he would support a parliamentary opposition leader Omurbek Babanov. Public opinion polls also favour the latter. It gave a push for rumours that President Atambayev only formally supports Jeenbekov understanding his weak personality and not wishing to see him as the next head of state. The public widely discussed the possibility of appointing Babanov as a prime minister in the circumstances when the previous referendum depleted the authorities of the president to be elected. And many think that Babanov would be better the prime minister than the president. However, Babanov himself denied any rumours about this potential development expressing the intention to redistribute the power balance in his favour by constitutional reforms if he wins these elections. Any presidential candidate holding a state authority position must resign (at least temporarily) from their post to prevent the power abuse, says the law. President Atambayev stated during his last press conference that the Parliament must form a new government demanding a full powered prime minister (usually during the election campaign only acting heads lead the government) before September. The parliamentary leader of SDPK Isa Omurkulov named the date of 21 August for an extraordinary session of MPs to discuss this issue. Parliament speaker Chynybai Tursunbekov came out, who even had renounced his plans to nominate himself as a presidential candidate, to mediate as a senior leader. Sooronbay Jeenbekov, meanwhile, according to the sources, declined to resign from his prime-ministerial job during his talk with President Atambayev adding he will leave only for vacation. In his opinion, it will simultaneously support his high status as a candidate nominated by the ruling party and provide him with wider prime-ministerial power if he loses. Discussions about President Atambayev plans to appoint 40-year-old Sapar Isakov as prime minister, who also governs the President's Office and oversees foreign policy, is another dominant topic in the power house. Isakov was a close aide of Maksim Bakiyev, who is the song of the ousted in 2010 president Bakiyev. It is quite meaningful that Isakov got news about the revolution in Washington DC, where he had organised the visit of Maksim Bakiyev, de facto successor of his father. US diplomatic cables published by Wikileaks caused a stir when revealed Isakov sharing confidential information with American diplomats about the difficult relationship of President Bakiyev with Russia and leaning towards the US. President incumbent Atambayev could not get along with his revolutionary comrades and is now surrounded by the ousted president's cadres. 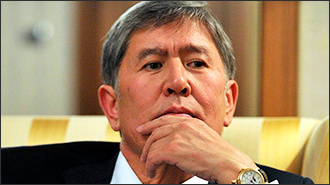 Interests of all leading forces competing for the highest post, including Omurbek Babanov, Bakyt Torobayev, Temir Sariyev and even Sooronbay Jeenbekov, are willing to oppose plans of President Atambayev to form a government entirely loyal to him in the fuss and troubles of the elections which, he stated many times, must control until 2020. Observers see the win of a small Czech company to build ten small hydropower electric stations backed by Sapar Isakov caused a tremendous scandal, and it was he who shelved the letter of the Kyrgyz Foreign Ministry protesting against the cooperation with Czechs. His bet on the programme of reforming the state services called “Taza Koom” (Clean Society) is also failing. It is still unknown whether President Atambayev would withdraw his plans to form a new government right before the presidential elections under a pressure from others. His hunt for political and media opponents, former members of Parliament and ministers challenges these plans. The opposition leader Omurbek Tekebayev faces a fate to be jailed by his old revolutionary comrade Atambayev. But Tekebayev is still a presidential candidate too, although his chances to participate in the campaign are very weak; he is not able to pass a Kyrgyz exam because he is in detention. As the history of the young republic tells, a self-confidence in excess can bring troubles to the authoritarian leader, sharp destabilisation and even ousting. While ousted Akayev and Bakiyev could find refuge for themselves abroad, Atambayev managed to deteriorate relations with his close and distant neighbours. Even benevolent Kremlin is not ready to support Atambayev's successor.